Teach your students the biblical narrative from Genesis to Ruth (including Job). Written at a second-grade level, The Old Testament presents an unfolding narrative of God's faithfulness to his people, while the overarching Old Testament themes are presented in simple weekly stories. Students will also learn how the Old Testament stories begin to point us to the coming Savior, Jesus Christ. The text contains thirty two chapters (one per week) and divided into five themed units. Before the week's story, each chapter opens with a Memory Page that includes a weekly memory verse, a Key Facts chart, and vocabulary to remember. A thought-provoking "Who is God?" question will encourage children to consider what they are learning about Him and how to relate to Him in their own lives. Each chapter also contains a worksheet and a quiz. A review chapter at the end of each unit summarizes the material and provides extra puzzles and activities. 238 pages, softcover. Grades 2-6. Pages are consumable and not reproducible. I: In the Beginning -God's Power. Unit IV: Through the Wilderness - God's Provision - God's Redemption. Unit V: In the Promised Land - God's Faithfulness. This Teacher's Materials book accompanies Classical Academic Press' God's Great Covenant: A Bible Course for Children, Old Testament Book 1. Student worksheets are reproduced with the correct answers overlaid; notes to parents & teachers provide catechism questions, background information, scripture references, and instruction. 242 pages, softcover. God's Great Covenant: Old Testament 1 Teaching Videos are a fantastic way to bring a theologically trained instructor right into your home or co-op! Dr. Christopher Perrin (MDiv, PhD) provides biblical instruction even young children can understand while also deepening the knowledge of teachers and parents. Featuring over 15 hours of instruction that covers Genesis through Ruth, along with video of biblical passages and scrolling text, this set of 12 DVDs is a fantastic way to dig deeper into the text. 12 DVDs. Students can listen to the story of God's work through the Bible with this convenient MP3-Audio CD. 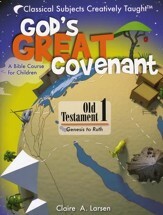 This resource contains the story time readings features in the God's Great Covenant Old Testament 1 text, and are read by Christopher Perrin. MP3 Format. Beginning in 1 Samuel (where the first volume left off), and continuing all the way through Malachi, this student text continues the journey of God's people as they become the nation of Israel. Each chapter begins with a memory page that provides the scope, theme, memory verse, key facts, and message from the topic; "Story Time" follows, with the lesson to read; finally, fun worksheets help students retain the key facts, memory verse, have fun with puzzles, and provide additional Bible skills through "find out" exercises. Taught chronologically by means of engaging stories, God's Great Covenant, Old Testament Two illumines the events and people of the Old Testament, from David to Elijah to Esther to Nehemiah. Various prophets are studied in their context, so their lives and words can be understood in relation to their own time as well as times to come. Chapter quizzes, a glossary, maps, and helpful lists are provided in the appendixes; review chapters with extra puzzles and activities summarize each unit's material. 296 page, softcover. Grades 2-6. 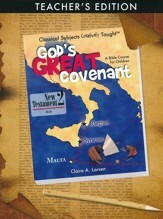 This Teacher's Materials book accompanies Classical Academic Press' God's Great Covenant Old Testament 2 Book. Student worksheets are reproduced with the correct answers overlaid; notes to parents & teachers provide catechism questions, background information, scripture references, and instruction. 296 pages, softcover. 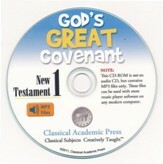 Students can listen to the story of God's work through the Bible with this convenient MP3-Audio CD. 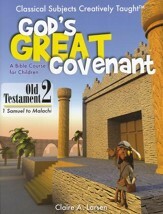 God's Great Covenant Old Testament 2 continues to follow the journey of God's people as they become the nation of Israel by chronologically studying the second half of the Old Testament from Samuel to Malachi. This audio resource contains the reading features in the God's Great Covenant Old Testament 2 text from Classical Academic Press. Read by Christopher Perrin. MP3 Format. Keep track of the geography and chronology of the Bible! 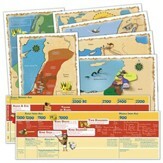 Designed to accompany Classical Academic Press' God's Great Covenant Old Testament curriculum (Volumes 1 & 2), this convenient set includes a time line of the events of the Old Testament and a collection of six maps that integrate the history and geography of the ancient Near East and ancient Egypt. The reversible timeline features a completed version on one side, with all events and images included. The other side is blank for students to add the included cut-out images and events as they progress through the series. There are three separate tracks so students can follow the events of The Fertile Crescent, and Ancient Egypt along with the events of Old Testament. The time line stretches to 76". Continuing the narrative of Classical Academic Press' previous God's Great Covenant Old Testament Volume 1 & Volume 2, this curriculum focuses on how Jesus is born and fulfills all God's promises. Thirty-six weekly chapters are divided into four units that emphasize one of the names of Jesus: the Son of Man, God's Servant, the Messiah, and the Son of God. Each chapter begins with a memory page that provides the theme, scripture, memory passage, key facts, and message from the topic; "Story Time" follows, with the lesson to read. Finally, enjoyable review worksheets help students retain the key facts, story facts, memory verse, and encourage critical thinking with a "Think About It" question that encourages students to apply Scripture to their own lives. A section of quizzes is included in the back of the book. Grades 3-5. 346 pages, softcover. NIV and NKJV Scripture used. Consumable; non-reproducible pages. 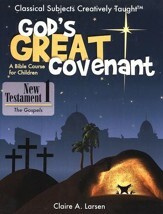 This teacher's guide accompanies the sold-separately God's Great Covenant: New Testament Student Book 1. Student worksheets are reproduced with the correct answers overlaid; notes to parents & teachers provide incredibly detailed background information, scripture references, and lesson instruction. 346 pages, softcover. Students can listen to the story of God's work through the Bible with this convenient MP3-Audio CD. 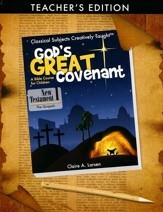 This audio resource contains the story time reading features in the God's Great Covenant New Testament 1 text from Classical Academic Press. Included in the more than three hours of recording are thirty-two stories from the four Gospels. Read by Christopher Perrin. MP3 Format. Continuing the narrative of Classical Academic Press' God's Great Covenant New Testament Volume 1, this curriculum focuses on the spread of the gospel in the early church as shown through the Gospels and Acts. Thirty-two weekly chapters are divided into five units that present establishing the church as an adventure ("The Mission"), guided by the Holy Spirit ("Our Guide") and directed by God's Word ("The Map"), and which needed to grapple with internal and external enemies ("The Enemy"), and become equipped to spread to the gospel ("Travel Gear"). Each chapter begins with a memory page that provides the theme, scripture, memory passage, key facts, and message from the topic; "Story Time" follows, with the lesson to read. Finally, enjoyable review worksheets help students retain the key facts, story facts, memory verse, and encourage critical thinking and deeper analysis with an "Unpack it Further" section. Quizzes for each chapter can be downloaded at the publisher's website. Grades 3-5. 344 pages, softcover. NIV, ESV, and NKJV Scripture used. Consumable; non-reproducible pages. 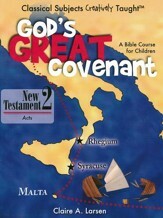 This teacher's guide accompanies the sold-separately God's Great Covenant: New Testament Student Book 2. Student worksheets are reproduced with the correct answers overlaid; notes to parents & teachers provide incredibly detailed background information on general books as well as specific verses, scripture references, lesson instruction, and room to write in notes. 344 pages, softcover.